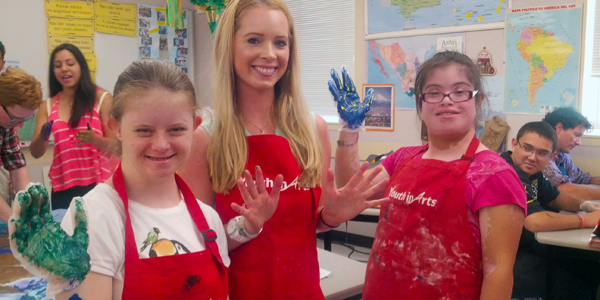 “Arts Unite Us” (previously VSA) provides opportunities for students with special needs and different learning styles to share their creative voices and bring people of all abilities together through the arts. Programs include tailored residencies in special education classrooms culminating in “sharing sessions” for peers and family, integrated residencies that engage special education and general education students in collaborative projects. Youth in Arts has a long commitment to providing arts learning opportunities for youth of all abilities. 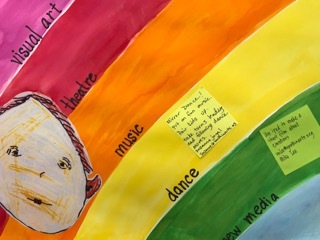 For decades we have been the only consistent arts provider in Marin County’s Special Day Classrooms (SDCs), and in 1981 we became an affiliate of VSA, an international, nonprofit organization founded by Ambassador Jean Kennedy Smith to create a society where all people with disabilities learn through, participate in and enjoy the arts. Presently we receive a contract from the Kennedy Center to provide for some of our programming. We created the “Arts Unite Us” initiative in 2008, specifically to address the isolation that we saw many of our students with special needs and their families experiencing in school. In 2013 we decided to bring all of our programs for individuals of different abilities under the “Arts Unite Us” name, to celebrate how the arts provide and accessible way for children to share their creative voices. So many times in these programs, we have seen children who do not speak express themselves through song or through visual art. And in our integrated residencies where youth with and without disabilities work side by side, we see not only creative collaborations develop, but true friendships. YIA Mentor Artists who teach in “Arts Unite Us” programs are highly skilled at adapting programs for differed ability levels, as well as behavioral or emotional challenges. Residencies can address many IEP goals including Fine/Gross Motor Skills, Verbal Skills, Language Development, Visual-Spatial Awareness, Social Skills, Concept Development and Adaptive Behavior. We know art has the power to engage, excite, and inspire students of all abilities. Whether it is the visual arts, theater, dance, music, or new media, creative exploration has been known to help students reach learning and behavioral objectives in productive and innovative ways. 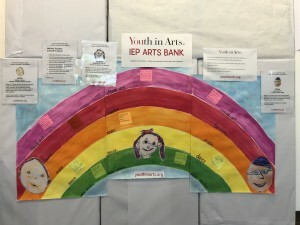 But with hundreds of lesson plans available online and no way to match them up to your student’s needs, it can be difficult to find exactly what you’re looking for – which is where the Arts Knowledge Bank comes in. The Arts Knowledge Bank is an online, searchable database for educators, administrators, parents, and students to use to achieve their personal goals. This bank will help harness the potential the visual and performing arts can have on the educational outcomes of all students. Know of an arts-based activity, project, warm-up, or lesson plan that successfully reaches learners with diverse backgrounds, experiences, and abilities? Educators and artists are invited to add to the bank with our easy on-line form below. Check back here and sign up for our email list for updates. To add your own activity. Please go here. For more information on bringing visual or performing arts to your special education classrooms or creating a truly integrated program for your students, email Kelsey Rieger or call 415-457-4878 ext. 120.